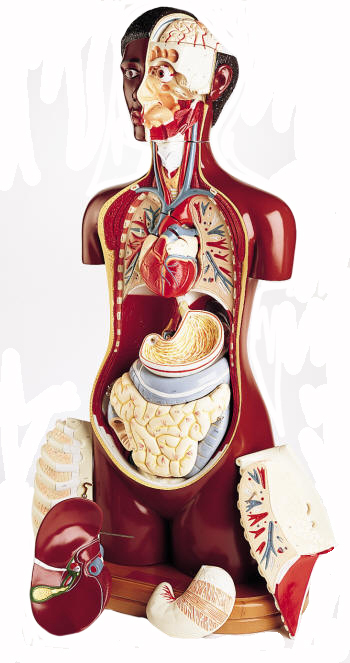 The Know Body Deluxe Teaching Torso has the following detachable parts: head; eyeball with extra ocular muscles; brain half with arteries - four parts including cerebellum, cerebrum (two parts), and brain stem; left lung with ribs (showing pulmonary blood vessels and bronchioles sectioned open); right lung with ribs (showing blood vessels and bronchioles intact); heart (two halves); liver and gallbladder with color coded blood vessels and ducts (includes section of diaphragm); stomach (two halves); large intestines; small intestines; and torso unit. Mounted on rotating hardwood turntable base. Twenty-three dissected or dissectible structures, and sixteen detachable parts.